LONG ago…back when we were first married, I got a crock pot as a shower gift. I didn’t know a thing about them, or cooking for that matter. I ended up religiously going through the little recipe book that came with the crock pot. Two of the recipes in the book have lasted the test of time and I still make them very regularly. My original book was so battered and beaten that when I saw another copy at the thrift store for 25 cents, I bought it. The recipe I am sharing with you today is Beef Stew. I’ve tweaked the recipe over the years but for the most part, it’s still similar to the original recipe. Here is the original recipe…. The original makes a HUGE amount. I more or less half it…no worries though. Whatever you do, it turns out every time! The day I made it and took the picture I didn’t have celery so I skipped it. I didn’t have canned tomatoes. I used two cans of condensed tomato soup instead. I didn’t have cloves or bay leaves so I skipped them. I keep all of the veggies that are left over from the open can from the childcare kiddos. If we have corn and they don’t eat it all, I put the extras in a freezer bag and toss it in the freezer. I mix the veggies all in the same bag so this day when I grabbed the frozen veggies out of the freezer there were peas, corn and green beans in it. I tossed all of them in. It makes for a more colorful and tasty stew. I only put it on high for four hours. The recipe is so forgiving I really only HAVE to HAVE the stew meat, tapioca and tomatoes. The rest is personal choice…or the choice of what’s in the cupboard. Over time I’ve started to add some garlic powder and onion powder…I often add a little beef bullion soup starter. Honestly, the sky is the limit on this. But, I want to say this….I’ve never had a bad batch and it’s never been the same any one time. Years ago when we were cleaning up my dad’s farm getting ready for an auction, I needed to feed all my siblings, spouses and some of the grandchildren. I ended up making this only doubled the recipe and made it in a roaster instead. That was SUPER easy and a great way to feed a crowd. I often make homemade bread or biscuits with this….YUM. Good old comfort food at it’s best!!! This entry was posted in recipes on September 15, 2018 by Jo. I got the same crockpot and recipe book. The crockpot has long since died! I use quick barley instead of tapioca and leftover roast beef if I have it. I’m making it tomorrow! It must be soup weather! Libby, That is too funny, but I could see my husband doing something like that as well. Crock pots are great. I had that same crock pot and recipe book many years ago. That looks good and sounds easy. I need to try it. I do use my crock pot, guess I need to start using it more. Thanks for sharing. I couldn’t live without my crock pot during cool weather seasons. I make soup often, and each time there is plenty of leftovers for freezing. I also do things besides soups, but not as often. With fall weather coming soon, it won’t be long until I pull out the crock pot and use it regularly all fall and winter. Love it!! Thanks for reminding me of this wonderful recipe and also for your take on it. I think I will make it tomorrow! I think I will use hamburger as that’s what I have in my freezer. I always enjoy your recipes and know they will be good. I think I will use some tomato soup in mine too, as well as the garlic and onion seasonings. Again, thanks! I’ve also made this for years – I think my recipe called for potatoes as well and tomato juice instead of tomatoes. I’ve used all vegetables – fresh, frozen, dried, canned, they all work – and swapped tomatoes for tomato juice, used cut up pork or chicken (because that is what I had), it is good every time! When it finally gets cooler I am going to have to make it again. 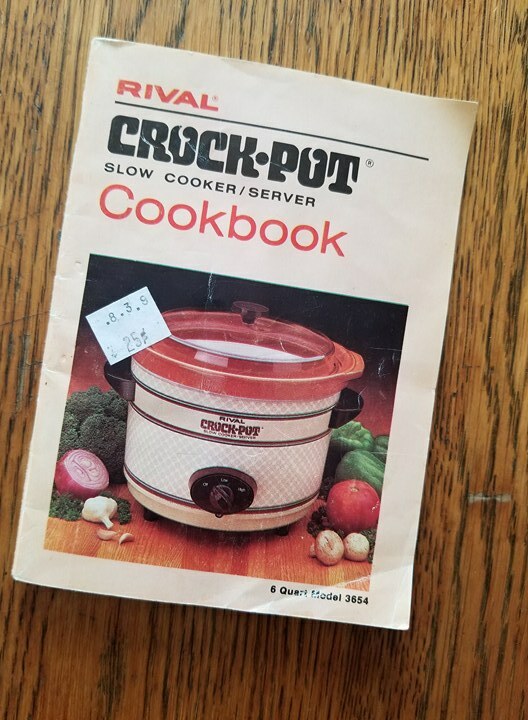 In about 1983 my mother-in-law gave me the 3 quart version of this crock pot for a Christmas gift. I still have it and use it to this day. I made a version of this stew out of the book that came with it for all these years. I always added a can of corn and a can of green beans and left out the migraine causing bay leaves. And made biscuits to serve with it. Ah, memories. Crock pots are a great invention. My old one has been gone for years. I went to buy a new one, but there were bad reviews on the latest models. I ended up buying a Hamilton Beach one and really like it. I use it a lot. Getting ready to try some Jamaican Jerk Chicken tomorrow (fitslowcookerqueen.com) that I found on Pinterest. Tonight, a homemade Hamburger. My son stopped and bought me a few homegrown tomatoes because I had been saying I hadn’t had one all summer. Yum! By the way, how were your homemade cinnamon rolls this morning? I have also used that recipe for years (just celebrated 45 yesterday). The original crockpot finally bit the dust, but I kept the book and use it with my more modern crockpot. Still tastes the same! I think I do pretty much the same things, altho I have added cubed turnip to it when I’ve had one and it is great! I also have a similar recipe but I call it “Quilt All Day Stew”! I use one can tomato soup and one can cream of mushroom soup. I have made this same stew for years… in the oven. I think I have made it in the slow cooker too. I only use 2 tablespoons of tapioca and V-8 juice. Typically I make it with the stew meat, carrots and potatoes or whatever else fits and suits the mood. Found in my mother’s recipe box back in the 1960s it was called Forgotten Stew. It was not a recipe I recall her ever using. But, once married, I would make it and it is a family favorite. Right now, my husband is out of state for work with a crazy schedule staying with our daughter. Before he left I made stew and put the leftovers in jars and froze it. He took it along so that when he got back to her house at the end of a long day, he could easily microwave it without them having to save food for him.